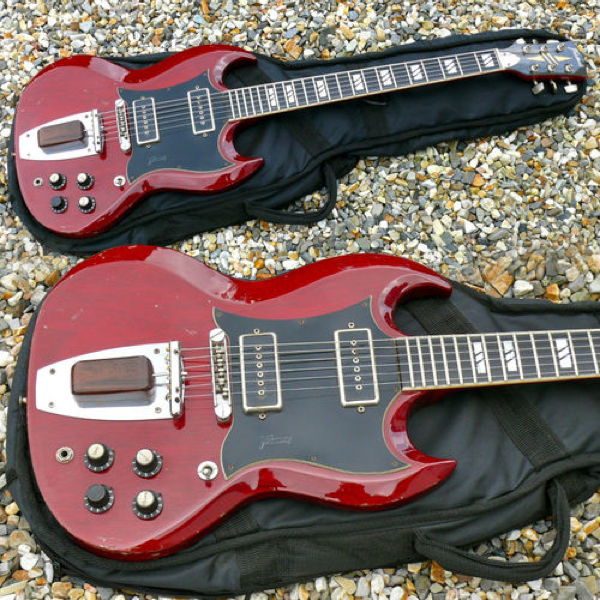 While in Soviet-era East-Germany, guitar companies were developing new instruments for a new society, based on the lutherie tradition of Markneukirchen, with radically new designs and solid technology, capitalist West-Germany was busy copying successful American models, such as this Framus version of a Gibson SG. 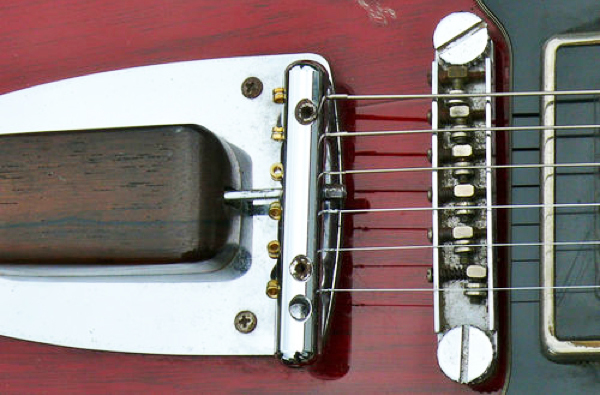 Still this guitar has a bit of German experimental spirit with this strange wooden block on its Jaguar-esque tremolo, though I have no idea of its use, having never seen such thing before... Anybody amongst our readers could explain this? Seems like the trembar is missing? Probably something like a mustang one. The wooden block looks as though it is just there to cover the mechanism-I imagine that there was once an arm that plugged into that extra hole in the bar tailpiece where the strings attach. Also note the inevitable half-removed Gibson logo on pickguard. There couldn't have been all that much 'travel' on that either. Perhaps a step or two but this pre-dates dive-bombing and was adequate for its time. After looking at about a million Bigsby's on SG's, this is almost refreshing! Wish they'd have done a picture with it off. Guessing the wood block is not original but rather a replacement when the chrome plated spring housing was lost. One of the orig. knobs is missing and a black one was sub'd in. Also possible the vol/tone decal is missing. Still and all, a very cool guitar and well worth a bit of spit and polish. Nope, it's original. I've got one, too. The spring is inside the block. I remember seeing one of these many years ago. The wood block is original. it hides the spring. The arm would fit in the hole below the bottom screw on the retaining bar. pretty ugly IMO. I apologise if this is the second time I've replied but I'm 99% sure I didn't get the captcha code thing right. but it still says your comment will be visible after approval. on that note I'm sure it's putting a lot of people of commenting as sometimes I have to refresh it several times before I can read it. I know you wish to stop spam comments so I guess it's something we have to put up with. It would've been more exciting if this were some sort of "pulse trem" or "palm slam wammy" but turns out generic after all? Thanks for clarifying.